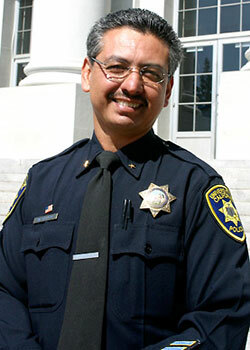 UCPD Chief Mitchell Celaya announced his retirement effective Dec. 31 in a campus-wide email sent Wednesday night. Celaya has served at UC Berkeley for over 30 years after first joining the department in 1982, according to the message. Until a replacement is found, UCPD Capt. Margo Bennett — who has served with UCPD as captain for around 10 years — will serve as acting chief. A nationwide search for a new chief will begin immediately, according to the message. “Under his leadership, the UCPD has distinguished itself as an exceptionally cohesive and professional campus police force,” the messages reads. Celaya moved up the ranks from officer to lieutenant to captain, assistant chief and ultimately to chief of police in August 2009. At the time, he replaced then-UCPD chief Victoria Harrison after she retired. According to Calistoga Police Department Stg. Tim Martin, Celaya has accepted a position with the department, which is in Napa Valley. Martin said Celaya would start “sometime in early January” following a background check process. UCPD declined to comment on the new position. Martin said that there was about 5,400 citizens that live within the city, but that the city sees a large influx of tourists. Over the decades, Celaya has helped manage some of the campus’ most difficult emergency situations, including anti-apartheid demonstrations and mass arrests, People’s Park demonstrations and riots and the infamous tree sit-in protests that ended in 2008, according to a campus press release. In recent years, the UCPD has received criticism from protestors and campus members for alleged excessive force at the Nov. 9 Day of Action last year and continued police actions against activists. During his term, however, Celaya was awarded the UC systemwide Meritorious Service Award for his response to the 1992 assassination attempt on Chancellor Chang-Lin Tien. UC Berkeley Chancellor Robert Birgeneau also announced that he would be stepping down Dec. 31. This recent announcement by Celaya means the campus must now fill two prominent positions before the end of the year.